Here is something you may not know about me: I have a an immense collection of Christmas ornaments. And when I say immense, I really mean it. See for seven years, throughout high school and college, I worked at a local mom and pop pharmacy/gift store. This store also happened to carry Hallmark cards and gifts. Every holiday season, I would spend a good portion of my paycheck on Hallmark Keepsake Ornaments. Even though I was still living in my mother's basement. After seven years of doing that, I have quite a few boxes of ornaments to pull down from that attic every November. So many ornaments that they don't all fit on our huge nine foot tree. Last week at Comic-Con International in San Diego, Hallmark unveiled several exclusive Keepsake Ornaments that were available to purchase only at the event. 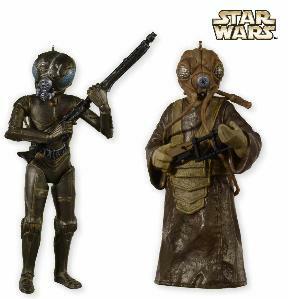 Including this very awesome Star Wars themed two-pack of 4-LOM and Zuckuss from Star Wars: The Empire Strikes Back. Only 1,000 sets were made so if you were lucky enough to be at this event and buy one, well I am beyond jealous! Those of you that have been following me for a while know how much my family and I love Star Wars. In fact, every Christmas we have a Star Wars Christmas tree which displays only Star Wars Hallmark Keepsake Ornaments that I have collected over the years. My family also has a pretty strong love for all things superhero related and The Avengers heroes are definitely a favorite. I was so excited to celebrate a little Christmas in July courtesy of Hallmark. My gift pack included an Iron Man Keepsake Ornament, DC Super Friends You're A Hero Recordable Story Book and two Text Band. The first thing I did was lock myself in our office and record my voice into the book. It was super easy to get each page recorded and I was done in roughly five minutes. That night at bedtime I gave the boys the book and they really love listening to me read each page to them whevener they want. As I mentioned I love Christmas ornaments, so I think my new Iron Man one is beyond cool. It also comes with a stand so you can either hang him on your tree or display him on a shelf. You can see that the stand is part of the S.H.I.E.L.D. 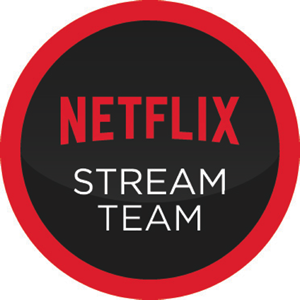 emblem from The Avengers. 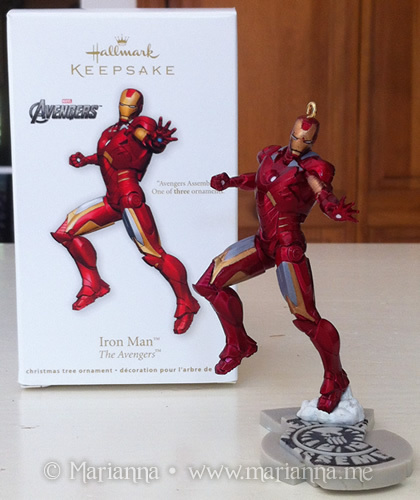 For the 2012 holiday season, Hallmark also created a Thor and Captain America ornament to go along with Iron Man. All three ornaments have a stand with part of the emblem and if you buy all 3, the stands snap together to make an awesome display. 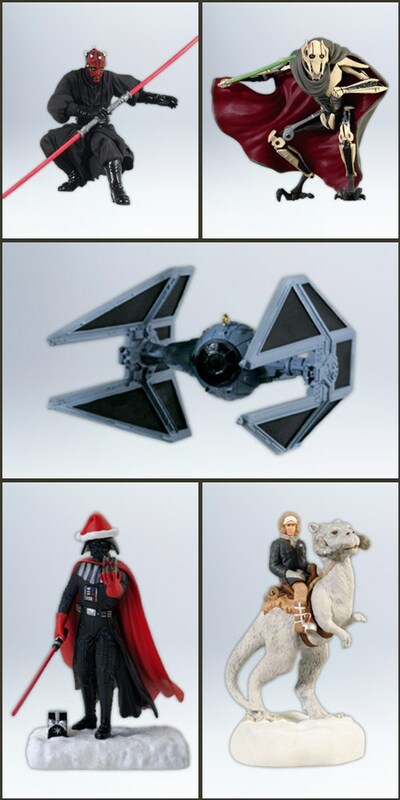 Hallmark also has five new Star Wars Keepsake Ornaments for 2012 and somehow I have to find a way to get my hands on all of them. There is plenty of room on our Star Wars tree for more! At the very least I need to pick up General Grievous and Han Solo on the Tonton. Oh and Darth Santa is simply hilarious so I will need him as well. I also received some cool new Text Bands in my gift pack which is a fun way for kids to send text massages to each other. They can create a message of up to 10 characters and then in order to exchange their message, they can either fist bump or high five. 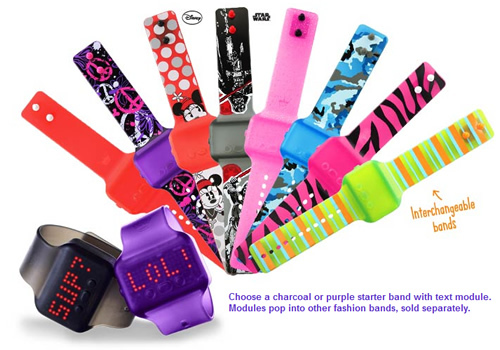 There are a variety of fashion bands that can be purchased separately so your child can have one that matches their style. Do you see the Star Wars band down there? Hallmark Keepsake Ornaments started hitting stores this month, so be sure to head in to see what else is available this year. In addition to Star Wars and The Avengers, there are so many other ornaments pulled right out of pop culture like Twilight and Brave. Personally, I am super duper excited for the Gigi ornament as that is one of my all-time favorite movies. I am adding it to my Christmas list (ahem). And now I am off to hunt down the 4-LOM and Zuckuss set on eBay. 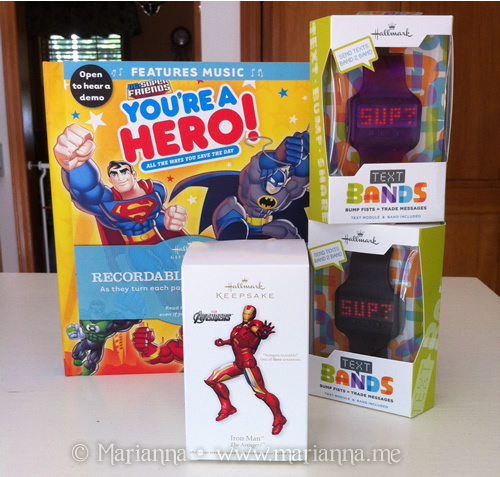 One (1) lucky winner will receive a Hallmark prize pack which includes one Iron Man Keepsake Ornament, one DC Super Friends recordable storybook and two Text Bands. Giveaway is open to US only and ends on August 1, 2012 at 12:01 am EST. Please use the Rafflecopter form below. Berrylicious! I also like the Baby's First Christmas 2012, since my youngest missed it last year by 2 days. My favorite ornament is Iron Man. I love this ornament because I know this is the ornament my husband would choose. I would love to win this awesome prize pack for my hubby and my little boy. My husband is such an amazing person and he has worked so hard to give me and our son a good life. He always puts us first and he never gets anything for himself. I know this would make his day, and he could save some of the things for our son who is 19 months old. My son already loves superheros because his daddy is always talking about the new superhero movies and my hubby collects comic books and they look at them together, it is something they share :). I know both my husband and son would love this, so thanks so much for the chance to win this. I love The Amazing Spider-Man ornament! You should see our tree each year it reflects who we are , and what we enjoy! Lots of Hallmark ornaments, I mean lots...I couldn't just narrow one, but my favorite is the Magician Mickey, then the man behind the curtain, and green lantern. Thanks for the contest! I like the Monsters, Inc. Keepsake Ornament. santa Darth. The boys would love him! 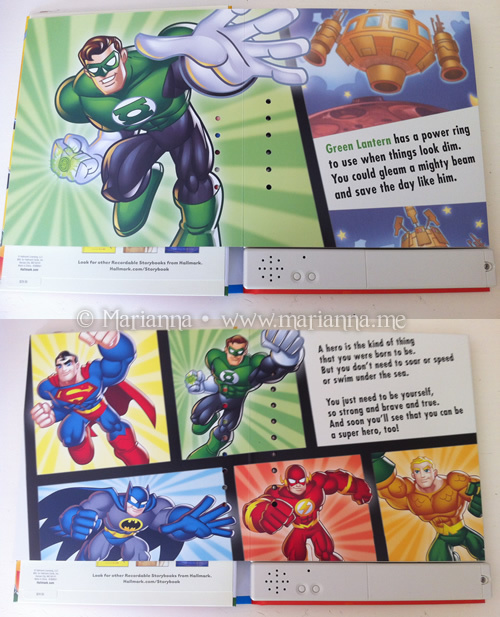 Love the superhero ones! 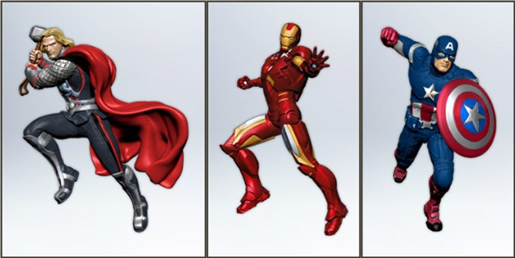 Spiderman, Batman, Ironman and Thor! The Harry Potter one is pretty epic. I love the Scarlett Meets Her Match. Keepsake Ornament is my fave!! I like the Santa's Rooftop Racer. My fav is deck the house ornament. I like the grandson ornament. I love the Mischievous Kittens. I like the Dark Knight Rises Batman keepsake ornament. I like the Rock the Halls! ornament (my husband plays the drums). I like the Bouncing Through the Snow ornament. I really like the Catwoman one! I love cat woman and of course Iron Man! I really like A Clever Cat.The cat in the hat is a favorite of mine. My fave is Santa Darth! My favorite ornament is Iron Man. I like the Lion-O ThunderCats Classic Keepsake Ornament. Thanks!! My fave is the The Dark Knight Rises Batman Keepsake Ornament! I like the Tink and the Fairy Journal. Hallmark put out so many great ornaments this year, it is hard to pick just one favorite. If I had to narrow it down to one though, I guess it would be Merry Christmas To All.